Slovak halušky (hah-loosh-kee) are traditionally boiled dumplings made with a grated raw potato dough. They can be eaten as a side dish or main course. Some cooks use a combination of grated raw potatoes and grated cooked potatoes in the dough, while others add diced cooked potato to the boiled dumplings if they will be combined with bryndza cheese, a sheep's-milk cheese when it is known as bryndzové halušky. The only other ingredients are flour and salt, and optional eggs. 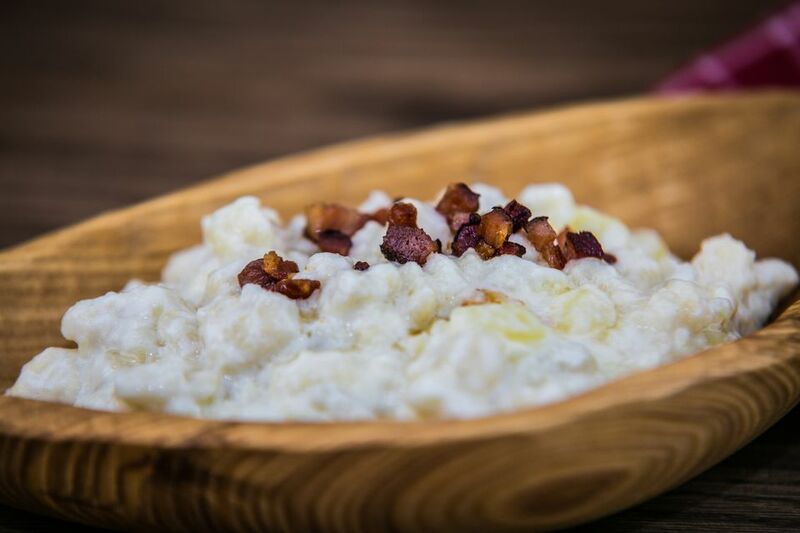 At their very simplest, haluški are served with bacon and chives, as in this recipe. The Slovak version of halušky is different from Polish haluski, which is a combination of noodles, cabbage, and onion. These Slovak dumplings are similar to Polish Kartoflane Kluski. In a large skillet brown bacon with onion, if using, until cooked. Set aside. Put a large pot of salted water on to boil. In a food processor, add chopped potatoes and process until completely puréed. Add salt and flour a little at a time, processing after each addition, until a spoon will stick straight up in the dough. Transfer dough to a cutting board. Using a knife, scrape about 15 small bits of dough into the boiling water. When they all float to the top, remove with a skimmer to a colander to drain. Repeat with remaining dough. Combine dumplings with bacon and onion, if using, and serve immediately.